Pastor with the Creation Science Ministry. Tell me about your work with the Creation Science Ministry. Basically, I give presentations on creation science to church audiences. My job is to demonstrate to lay people the scientific evidence in support of creation. Anglicans and Catholics have no problem accepting the fact of evolution. Why is it so important to you that the biblical account of creation be taken literally? I believe that the question“Where do we come from?” has profound implications for human society. If we teach children that they are advanced animals, it has implications for personal morality. Animals do things based on instinct, so there is no right or wrong. However, if we teach children that they are created in the image of God then there are rules – like the Ten Commandments – for them to follow. Are you arguing that it’s preferable for children to believe this, or that it’s actually true? Most people reading this are likely to believe in evolution. Do you think that they’re less civilised than you, or have no moral compass? No, it’s not about having a stronger moral sense than anybody else. It’s about having a different moral sense. It’s true that most scientists believe in evolution. But I think that’s because the majority have gone through secular universities, which aren’t very friendly to Christian values. Mainstream scientists though use empirical data and peer-reviewed research. Creation science, perhaps, doesn’t hold to that same standard? That’s a very common misconception. CreationResearch.org is a peer-reviewed scientific journal that’s published quarterly. You see, what mainstream science is telling children is that we’re all descended from an ancient ancestral monkey. It had a couple of mutations, which were favoured by natural selection, and these mutations survived and took over the rest of the population. The great objection to that is to find a favourable mutation that would happen not only once, but thousands even millions of times. Instead the world was created in a week in 4000BC and we’re all descended from a 900 year old man? Yes, I was astonished to find this out myself, but many ancient people lived to be over a thousand years old. This is not just from the bible. Ancient Greek genealogies say the same. Before the flood I would say, the environment was better. There was more oxygen in the air. After the flood, the world changed. Life expectancy dropped to off about 400 years and continued to fall. Abraham lived to 175. It finally stabilised at 70 to 80 years. And man and dinosaurs co-existed? I know it sounds funny. But every culture around the world has large reptile creatures in its folklore. In the bible, the Hebrew work Tannan, which usually translated as dragon, appears several times as a real creature. My guess is that they didn’t have the word dinosaur when they were translating the bible – it wasn’t invented until the 1800s – so they used dragon instead. Surely it’s unlikely that mankind would survive and dinosaurs become extinct. Dinosaurs were ferocious carnivores – they’d have gobbled us up! Creation scientists would say that it was because of Noah’s flood. The animals that Noah took on the ark with him were the ones that survived. And Noah wouldn’t have been able to fit dinosaurs on his ark, that’s obvious. But I would say that some dinosaurs did survive, particularly the water-going ones. During the great age of sea exploration in the 15th century there were thousands of reports of strange sea creatures sighted. 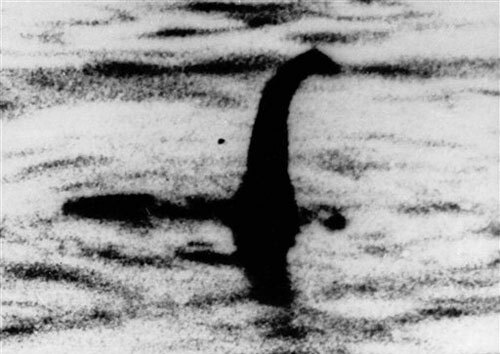 You’ve heard of the Loch Ness monster? The fact is that there are dozens of these lake creatures all over the world. There’s the Santa Cruz Sea Monster, for example, washed up on the shores of California in 1925. I would say that some dinosaurs have survived, but they’re very rare.